Genannt die „spezielle Phase“ erlebte Kuba nach dem wegfallen seines Haupthandelspartners Soviet Union einen künstlichen Peak-Oil und musste schnell umdenken und gegensteuern – Permakultur Spezialisten aus Australien kamen zu hilfe. 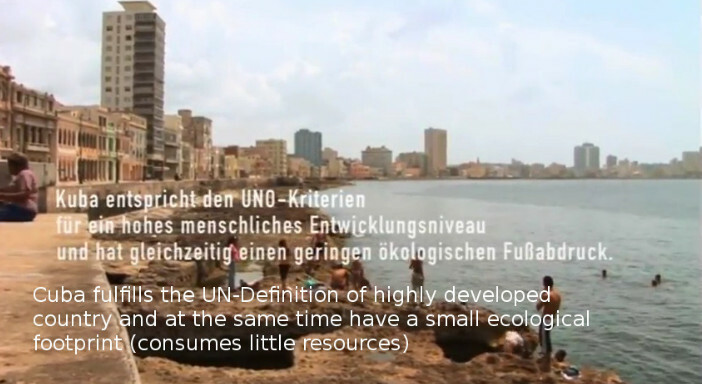 Kuba was forced by the US(EU) embargo to switch to 100% bio-natural self-sufficient agriculture. No one starved. Without OIL AND CHEMICALS! one chemo therapie costs 10.000€ – the more sick the planet – the more profits? now also available in German BEER! THANKS A LOT MONSANTO! Killing us SLOWLY WHILE MAKING PROFITS! During the Cold War, the Cuban economy relied heavily on support from the Soviet Union. In exchange for sugar, Cuba received subsidized oil, chemical fertilizers, pesticides and other farm products. 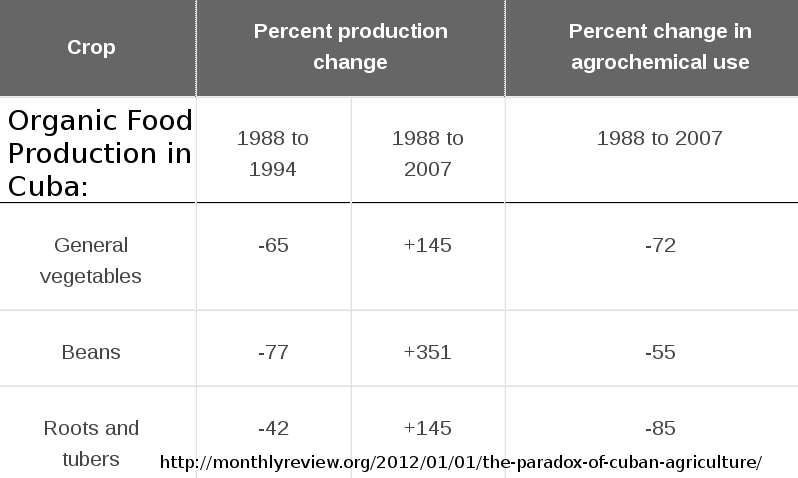 Approximately 50% of Cuba’s food was imported. Cuba’s food production was organized around Soviet-style, large-scale, industrial agricultural collectives. Before the collapse of the Soviet Union, Cuba used more than 1 million tons of synthetic fertilizers and up to 35,000 tons of herbicides and pesticides per year. With the collapse of the USSR, Cuba lost its main trading partner and the favorable trade subsidies it received, as well as access to oil, chemical fertilizers, pesticides etc. From 1989 to 1993, the Cuban economy contracted by 35%; foreign trade dropped 75%. Without Soviet aid, domestic agriculture production fell by half. This time, called in Cuba the Special Period, food scarcities became acute. The average per capita calorie intake fell from 2,900 a day in 1989 to 1,800 calories in 1995. Protein consumption plummeted 40%. 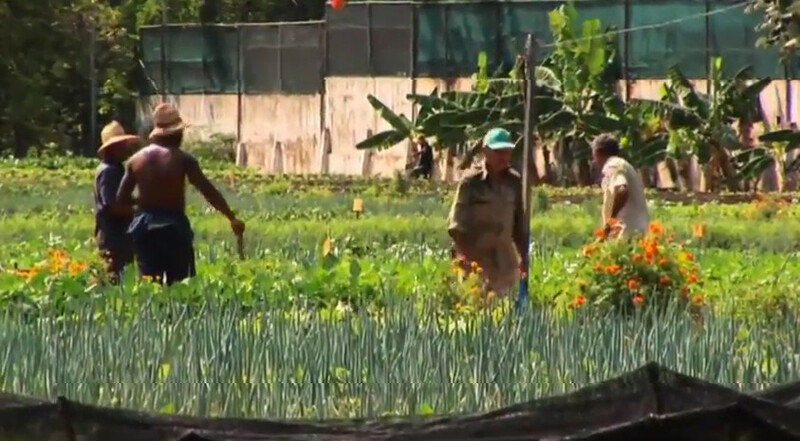 Without food, Cubans had to learn to start growing their own food rather than importing it. This was done through small private farms and thousands of pocket-sized urban market gardens—and, lacking chemicals and fertilizers, food became de facto organic. Thousands of new urban individual farmers called parceleros (for their parcelas, or plots) emerged. They formed and developed farmer cooperatives and farmers markets. 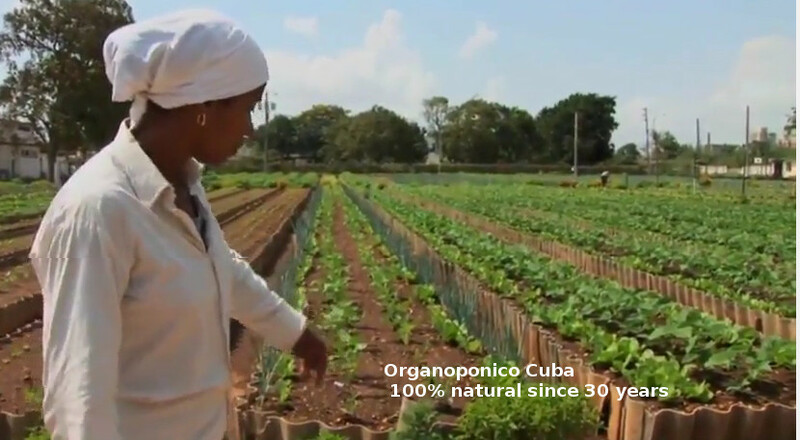 These urban farmers found the support of the Cuban Ministry of Agriculture (MINAGRI), who provided university experts to train volunteers with organic pesticides and beneficial insects. Without artificial fertilizers, hydroponic equipment from the Soviet Union was no longer usable. 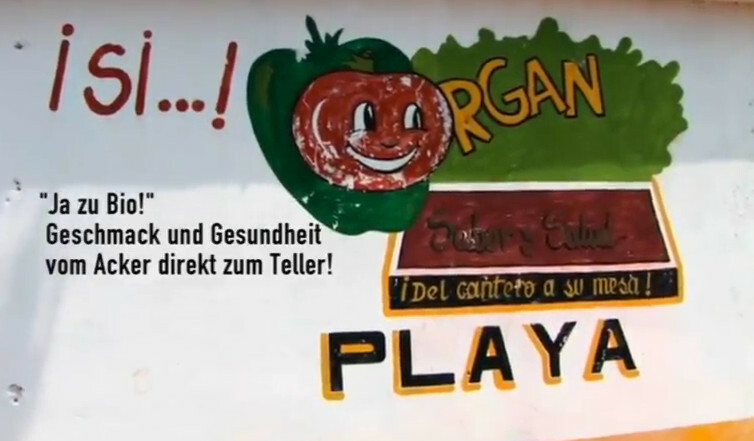 Instead, they were converted for the use of organic gardening. The original hydroponic units, long cement planting troughs and raised metal containers, were filled with composted sugar waste, thus turning hydroponicos („hydroponics“) into organopónicos. The rapid expansion of urban agriculture in the early 1990s included the colonization of vacant land both by community and commercial groups. In Havana, organopónicos were created in vacant lots, old parking lots, abandoned building sites and even spaces between roads. More than 35,000 hectares (over 87,000 acres) of land are being used in urban agriculture in Havana alone. Havana produces enough food for each resident to receive a daily serving of 280 grams (9.88 ounces) of fruits and vegetables. The urban agricultural workforce in Havana has grown from 9,000 in 1999 to 23,000 in 2001 and more than 44,000 in 2006. However, Cuba still has food rationing for basic staples. Approximately 69% of these rationed basic staples (wheat, vegetable oils, rice, etc.) are imported. Overall, however, approximately 16% of food is imported from abroad. The collapse of the Soviet Union, ending 1991, decimated the Cuban economy. The country lost approximately 80% of its imports, 80% of its exports and its Gross Domestic Product dropped by 34 percent. Food and medicine imports stopped or severely slowed. Perhaps most immediately impactful, however, was the loss of nearly all of the oil imports by the USSR; Cuba’s oil imports dropped to 10% of pre-1990 amounts. Before this, Cuba had been re-exporting any Soviet oil it did not consume to other nations for profit, meaning that petroleum had been Cuba’s second largest export product before 1990. Once the restored Russian Federation reemerged out of the wreckage of the Soviet Union, its administration immediately made clear that it had no intention of delivering the tanker after tanker of petroleum that had been guaranteed the island by the USSR; in response to this notification, Fidel Castro angrily cut off all oil delivery from Russia, merely one week later. He fell witness to an immediate need to reduce domestic consumption of what remained by 20% over a span of just twenty-four months. The United States law allowed humanitarian aid in the form of food and medicine by private groups. Then in March 1996, The Helms-Burton Act imposes penalties on foreign companies doing business in Cuba, and allowed U.S. citizens to sue foreign investors who use American-owned property seized by the Cuban government. Due to the external factors contributing to the energy crisis in Cuba, the collapse of the USSR who was their main source of petroleum and food imports, along with the various stages of the US embargo, this is referred to as an „artificial“ peak oil. The Cuban government was also forced to contract out more lucrative economic and tourism deals with various Western European and South American nations in an attempt to earn the foreign currency necessary to replace the lost Soviet oil via the international capitalist markets. Additionally faced with a near-elimination of imported steel and other ore-based supplies, Cuba closed refineries and factories across the country, eliminating the country’s industrial arm and millions of jobs. The government then proceeded to replace these lost jobs with employment in industrial agriculture and other homegrown initiatives, but these jobs often did not pay as well, and Cubans on the whole became economically poorer. 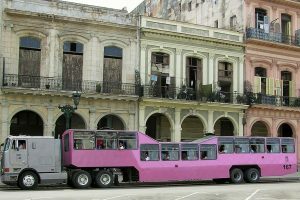 Alternative transportation, most notably the Cuban „camels“ — immense 18-wheeler tractor trailers retrofitted as passenger buses meant to carry many dozens of Cubans each — flourished.